When Richard became king in July 1189 he carried out Henry II’s expressed but unfulfilled intentions regarding John. John was made Count of Mortain, which placed him amongst the higher ranks of the Norman barons, but did not provide him with much income. This Richard resolved by marrying John to the great heiress, Isabella of Gloucester. She brought with her the Earldom of Gloucester, which made John one of the greatest barons in England and gave him a substantial income. However, there was to be more. The Pipe Roll of 1189 reveals that John had been granted the honors of Peveril, Tickhill and Lancaster, two manors in Suffolk, land in Northamptonshire, the profits of Sherwood Forest and the Forest of Andover in Wiltshire. The grant of the honors of Peveril and Lancaster included the honorial castles, whereas the castles of Tickhill and Gloucester were reserved to the king as was Orford Castle in one of the Suffolk manors. Further honors were also given: Marlborough and Ludgershall with the castles, Eye and Wallingford possibly without the castles. Before the end of the year he received the counties of Nottingham, Derby, Dorset, Somerset, Devon and Cornwall with the vill of Nottingham and its honor, but not Nottingham Castle. (2) John still held Ireland but after the disastrous earlier episode he no longer ruled Ireland personally. Richard’s grants to John virtually created a kingdom within a kingdom and it was hoped that this would satisfy John and keep him quiet when Richard left on crusade. This form of government might have worked had the personalities involved in the delicate balancing act done their share of the balancing, but it was not to be. (3) Since Richard was unmarried when he left on crusade, from which he might not return, and his subsequent marriage to Berengaria of Navarre failed to produce an heir, John was the only adult heir of Richard, as Arthur, son of their brother Geoffrey, was a mere child. Neither the government left behind by Richard nor Queen Eleanor herself, John’s mother, could afford to unduly upset John, a situation he fully exploited. Essentially, John wanted the castles which he had not received with their honors, such as Nottingham. Castles were status symbols and having an honor without the honorial castle was an impossible situation for a 12th-century baron to countenance. However much land he held, the lack of the castles diminished his status amongst other barons. Moreover, both Nottingham and Tickhill Castles were strategically important. Whoever controlled them and their respective honors was someone to be reckoned with and well-placed to commit both mischief and, if necessary, an act of defiance. John seized the castles of Nottingham and Tickhill in 1191, and held them more or less continuously for the next three years, despite the protests of the Council and his mother and attempts to dislodge him. The news of Richard’s capture and detention whilst returning from the Holy Land, which reached England at the very end of 1192, induced John to plot with Philip II, king of France, to displace Richard. The castles were still held for John, who was in France, when Richard eventually landed in England on 13th March 1194. 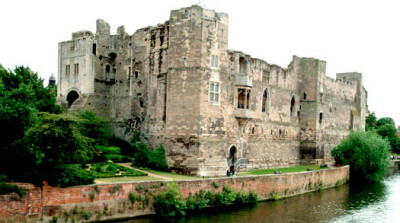 Richard’s siege of Nottingham Castle, from the 25th to the 28th of March 1194, has received scant attention from secondary writers on the period in contrast to the Council which followed its successful conclusion. (4) The brevity of the siege, lasting only three days, has led to the idea that it was an unimportant event. Its brevity was largely because of two factors: Richard’s military reputation and the immediacy and ferociousness of his initial attack, and the uncertainty of the besieged regarding their position. If they were in fact being besieged by the King himself they could expect little mercy for their act of defiance, but until they had ascertained that it was really Richard in person they were quite prepared to hold out for as long as possible; the Castle was well provisioned for an indefinite but prolonged period of time. (5) However once they had determined that they were besieged by the king rather than the agents of the Council, resistance collapsed. Nottingham Castle stands on a narrow ridge of sandstone to the west of the medieval borough of Nottingham. At its highest point, some 200 feet (61 metres) above sea level, on the southern end of this ridge, was situated the motte and keep in what was known as the upper bailey enclosed in the late 12th century by a stone curtain wall. Below this to the north was the middle bailey also enclosed by a stone curtain wall at this time. To the north and east, following the rock towards the south, was the outer enclosure. This outer enclosure was defended by an earth and timber palisade. There appears to have been only one gate in this palisade which stood where the present 13th-century stone gate is now. (6) To the west of the defended area of the castle was the park, to the north what was known as the northern bailey, and an area possibly largely uninhabited in the late 12th century. To the east of the outer enclosure was the French Borough of Nottingham, and beyond that the English Borough set on its own sandstone eminence. There are two detailed accounts of the siege of 1194: the chronicle of Roger of Howden and the panegyric poem Histoire de Guillaume le Mareschal. (7) It seems clear from the text of Howden that the chronicler himself was present during the siege. He was aware of events removed from the army but is less clear on the military operations, unlike the source of the Histoire. His presence seems detectable in the episode of the interchange between the Archbishops of Canterbury and York(8) and especially in the detail of the arrival of the Bishop of Durham from the siege of Tickhill Castle. It is probable that the person from whom the account of the siege in theHistoire was derived was also present. Although this unknown person was seemingly unaware of certain occurrences involving the king removed from the scene of battle beyond the siege lines, he took more interest in the military operations against the castle, especially the king’s own part in the fighting. Details may differ between the two accounts, and the Histoire has the siege lasting only two days instead of Howden’s three days, yet many of the details appear to be eye-witness accounts, for example theHistoire’s account of the king greeting with a kiss the leaders of the besieging army sent by the Council before his arrival; how Richard was armoured for the siege; the positions of the crossbowmen and the advance behind shields towards the castle gate; and the references to ‘our people’ and ‘our men’. Both Howden and the Histoire relate that a great battle and some fierce close fighting took place, even if Howden lacks the details of the operation. The king himself was in the thick of the fighting. Neither account gives any information as to the disposition of the army nor where it was camped. Nor is it known where the lodging of the king’s house was. Neither archaeological nor documentary evidence indicate how close to the castle walls the French Borough was built up in the late 12th century. The king’s prime objective was to take the outer gate, probably the weakest point, but how it was approached and from what direction is unknown. Since there was only one gate, then and now, according to Drage, the bulk of the army would have been concentrated in front of it. It is therefore pure speculation to even suggest the disposition of the army, where it was camped, or where Richard’s lodging was. Nevertheless, the general outline of the first day is clear enough. The first gate encountered by the army, which was of wood, was easily taken and the army with Richard moved into the bailey (outer enclosure). Here stiff opposition was encountered and some close fighting took place. Howden implies that there was a sortie from the stone-built castle since he stated that Richard forced the besieged back into the castle. Against fierce opposition the king and his men moved inexorably across the bailey (outer enclosure) towards the next gate of the castle. Howden and the Histoire state that the barbican before the gate was only taken with much bloodshed. Only nightfall (Histoire) brought the day’s fighting to a close and Richard and his army retired burning the wooden first gate on the way (Howden). According to the Histoire, this gate was burnt by the besieged as they retired behind stone walls and set fire to the barbican before the second gate. Thus at the end of the first day Richard had gained entrance into the first bailey (outer enclosure) and was in possession of it with the besieged penned in the rest of the castle. Richard now had a real problem on his hands: he was confronted by the stone walls of the middle and upper baileys which stood on higher ground than the first bailey. On the second day of the siege, 26th March, Richard pondered the problem before him: the stone walls of the middle and upper baileys of the castle. “The king of England caused to be made his petraries [siege-engines], having proposed not to make a further assault on the castle whilst his war-machines were being made ready”. (29)Payment is recorded on the Pipe Rolls to Master Roger the carpenter and his fellows for their machines and their other necessaries, and for at least one petrary and one mangonel. (30) Whilst the siege-engines were assembled and positioned, Richard entertained his troops and to intimidate the besieged in the castle: “he caused gallows to be erected near the castle on which he hanged certain serjeants of Count John taken outside the castle.”(31) Apart from the information that the gallows were erected near the castle, Howden provided no evidence as to where exactly they were or where the siege-engines were located. The ground on the south-east side of the castle would probably have been unsuitable for heavy siege-engines. They may have been placed in the quasi extra-mural northern bailey on the hill to the north overlooking the castle itself, or, possibly, in the recently captured outer enclosure. Here, however, they would have come under fire from the castle garrison’s weapons and would have had to be heavily protected as would the men building them. Howden does not state if the siege-engines were used but it is probable that they were. The Pipe Rolls disclose payments for work on the stable and small chamber, the gutter of the high chamber, the louvres and windows of the hall, a postern on the motte(32) and repairs to the chapels and houses on the motte,(33) damage which may have been caused by air-borne missiles. Also, it is noteworthy that the Pipe Rolls record no further expenditure of any significance for the castle for some years, apart from small sums for routine maintenance. The Histoire’s account of this episode differs somewhat. The incident of the king at dinner was placed on the first day of the siege after Richard had commandeered his lodging and before he put on his armour. The Histoire suggests that an informal and unofficial colloquy took place between the king’s men and the besieged. “Next day our people from outside went to talk with those inside and said that they must be mad to hold the castle against the king of England who was lord of the land. Then those inside replied immediately to our people that they were handing them a pack of lies, for they could not believe that the king was free, nor that he had arrived in these parts”. (36) Contrary to Howden who implied that the first move in negotiation came from the besieged, the Histoire has the first move on the part of the attackers and seemingly no important person was involved. The Histoire confirms Howden in that the besieged were totally ignorant of Richard’s arrival and could not believe in it anyway. Once the informal exchange of information had taken place, the news must have provoked some discussion amongst the garrison. “Afterwards they all asked if they could come to the army under a safe-conduct to see him [Richard]. Our men reported this to the king and the king approved and said that he agreed. Then they [the besieged] sent a knight, Sir Fouchier de Grendon, and Henry Russell with him. They both came to the king; they were both in the king’s presence. They looked at him closely and knew him from his bearing and from his face. ‘Am I him? What do you think?’, said the king. They said, ‘Yes.’ ‘You may go back freely’, he said. ‘That is right; do the best that you can’. They took leave and went away and reported what they had found. They considered their situation and surrendered themselves to the king’s mercy; they were wise [for] they greatly reduced their penal in this way. The king had captured the castle [and] this was very pleasing to all his men”. (37) This episode from the Histoire accords extremely well with Howden’s version. Two men were sent out by the besieged to inspect the king’s person to determine if it was Richard and the Histoire names the two men. Now the besieged had little choice but to surrender. After being apprised of the news, to continue their defiance of the king would be foolish given the king’s renowned military skill and consummate ability in reducing castles. They risked being attainted as traitors, losing their lives and having their families disinherited; no quarter would have been given once Richard had entered the castle by storm. “To cut a long story short, the king was so well-disposed and so mild and so merciful that he put them to fair ransom without further dispute”,(38) and others might have interceded on their behalf. Otherwise Richard would have had every right to arbitrarily dispose of them as he saw fit and no one, not even the church, would have blamed him for acting according to the understood rules governing sieges and war in general in the late 12th century. However, what does seem odd on the garrison’s part is the sending out of two nonentities, Fulcher de Grendon and Henry Russell. Henry appears in no other evidence. Fulcher de Grendon was a local man but of little consequence, a younger son of Serlo I de Grendon, lord of Bradley and Sturston in Derbyshire. (39) His father, and brother William, had extensive connections locally but it is difficult to understand how Fulcher would have personally recognised King Richard. Nevertheless their report was accepted by the besieged and there is no reason to doubt the veracity of the Histoire as to their names. Indeed, as two named nonentities its accuracy is vindicated. Although for the Histoire the surrender of the castle was complete and the siege over, it was not so in Howden’s account. William de Wenneval, Roger de Montbegon and twelve others had surrendered but there remained a hard-core element of resistance in the castle after their departure on 27th March. Howden provides no details, but further negotiation took place conducted this time by an important figure, the Archbishop of Canterbury. Only his mediation induced Ralph Murdac, his brothers Philip of Worcester and Ralph of Worcester, and others (unnamed) to surrender the castle and place themselves on the king’s mercy on 28th March 1194. (40) Thus the siege of Nottingham Castle was over. It had been short and to a certain extent bloody, especially on the first day. On King Richard’s part an example had been made. His prestige and fame as a soldier of skill and renown was intact and there could be no mistaking that the king was back and in full command of the kingdom he had left four years before. He had swiftly and decisively destroyed a very powerful threat to the security of his throne. The concentration of the extensive royal demesne and honors and lands in Nottinghamshire and Derbyshire in the hands of one man, such as John, Count of Mortain, had made that man very influential, but without the castles of Nottingham and Tickhill he would be relatively harmless. John’s acquisition and retention of these strategically important castles, although resisted by the Council, a council largely ineffectual until Richard was released, had allowed him to become highly dangerous. This concentration of castles and lands in Nottinghamshire and Derbyshire was recognised as a serious mistake and one which was not repeated for some time. The first day’s business of the Council consisted of putting up for sale several shrievalties to the highest bidder; the second day he heard accusations against Count John and his devoted supporter, Hugh de Nonant, Bishop of Coventry. On the third day, Richard levied a tax known as a carucage, and on the fourth day (2nd April) he heard complaints against Geoffrey, Archbishop of York, which were dismissed, and against others. (42) The king left Nottingham on the same day and went again to Clipstone to await the arrival of William the Lion, King of Scots. Whilst at Clipstone he commanded that all the men who had been taken in the castles of Nottingham, Tickhill, Marlborough and Lancaster, and in Mont St Michel, to be brought to him at Winchester on the day after the close of Easter. On Palm Sunday (3rd April) Richard was still at Clipstone, whilst the king of Scots stayed at Worksop “because of the solemnity of the day”. (43) Both kings went to Southwell, though the purpose was unmentioned, on 4th April, and the following day went to Melton. (44) Thus Richard, in the company of the King of Scots, left Nottinghamshire never to return. As promised, he dealt with the prisoners from Nottingham, Tickhill and the other castles at Winchester on 20th April: “the king of England separated the wealthier men from the others who were taken in the castles of Nottingham and Tickhill and the other castles of Count John and put [them] in prison for ransom; the others he allowed to go away to find pledges . . . and each one of them brought pledges of 100 marks if they should not return to the king’s court”. (45) Under the titles of “Fines made for the knights and men of Count John” and “Chattels and lands of the king’s enemies seised in the king’s hand by the sheriff”, the Pipe Rolls record the names of some of the men from Nottinghamshire and Derbyshire so fined at Winchester on 20th April. (46) These fines were slowly paid during the rest of Richard’s reign. There were a few remaining on the Pipe Roll when John became king in 1199. Thereafter they disappear; they were quietly dropped. Whatever faults King John had he rarely forgot service loyally given. 1. W.L.Warren, Henry II(1972), 594-630. 2. K. Norgate, John Lackland (1902), 24-9. 3. Norgate, op. cit., 24-55; J. T. Appleby, England without Richard 1189-1199 (1965), 1-169. 4. Norgate, op. cit., 50; Appleby, op. cit., 126-7, the longest account; J. Gillingham, Richard the Lionheart (1978), 241-2; W. L. Warren, King John (1961), 46. 5. P(ipe) R(oll) 6 Richard I, 87. Although the account is damaged, £ 145 17s. was realised from the sale of provisions after the siege, which included large quantities of corn, mixed corn, wheat, oats, beans, peas, bacons, butter and cheeses. 6. C. Drage, “Nottingham Castle: A Place Full Royal”, Trans. Thoroton Soc. xciii (1989), 19, 25, 37-40. 14. Appleby, op. cit., 124-5. 15. Histoire, 10081, after attending to his brother’s funeral. Meyer (Histoire iii, 134 note 4) questioned the confusion of the text concerning the king’s movements. It was probably William Marshall who left Marlborough and not King Richard. 17. Histoire, 10177-10187. Presumably only the more important men were afforded the kiss of greeting. 19. P.R. 6 Richard I, 95. This part of the roll is damaged. 25. Histoire, 10200-10234. The last two lines are corrupt. 27. Ibid., 243; Appleby, op. cit., 133-4. 28. Richard refused to arbitrate between Hugh and Geoffrey over the issue on 23rd April at Bishop’s Waltham, Hants. (Howden, 250). 30. P.R. 6 Richard I, 87. The account is damaged. 32. P.R. 6 Richard I, 80. 33. P.R. 7 Richard I, 15. 39. A. Saltman. “The Cartulary of Dale Abbey”, Derbyshire Arch. Soc. Record Series ii (1966), 2, 15. Serlo de Grendon had been under-sheriff to William Fitz Ranulph in 1177 (P.R.O. Lists and Indexes: Lists of sheriffs ix (1963), 102). 42. For details see Ibid., 241-2; Appleby, op. cit., 129-35. 43. Howden, 243, Apud Wirkesope propter diem solemnem. In other words, William, King of Scots, heard mass probably at Worksop Priory, whereas Richard stayed firmly put in the royal hunting-lodge. There may have been a reason for this. On his death-bed Richard confessed to not having received Holy Communion for seven years (c. 1192) “because in his heart he bore a mortal hatred for the king of France” (J. Stevenson, ed. Radulphi de Coggeshall Chronicon Anglicanum (Rolls series, 1875), 96). He did receive communion at Winchester on 17th April 1194 (Appleby, op. cit., 129 n. 1.). 44. Howden, 243, venerunt ad Maltonam. The editor of the chronicle did not query this and gave it in his marginal notes as `Malton’. As the kings passed through Rutland, Melton Mowbray must have been where they were on 5th April 1194. 46. P.R. 6 Richard I, 84-5. It is not possible to give accurate figures since a number of men must have compounded outright and only those who could only pay by instalments appear in the Pipe Rolls. Only nine men are named in the Pipe Rolls for the years 1194-5 but it is probable that a number of others are subsumed in other headings. Others emerge in later Pipe Rolls. I hope to discuss these men and their relationship to Count John, and the difficulties of the Pipe Roll evidence in another paper. I am particularly grateful to Doctors Margaret and Roger Middleton who translated the relevant passages of the Histoire for me. Charles Young and David Roffe read through a draft of the paper and I thank them for their useful comments, as always. This entry was posted in Articles and tagged 12C, Battle, England, High Middle Ages, Richard I, Siege Warfare, sieges. Bookmark the permalink.